Liam Smith outpointed Erick Ochieng “the Eagle” over 12 rounds to claim the vacant British light-middleweight title on Saturday night at Liverpool’s Olympia. The fight which was monitored by sportsnewsarena.com saw Smith effectively use his jabs to score a unanimous 117-112, 117-112, and 116-113 victory over the London-based Ochieng. It was not an easy fight after Smith promised to make short works of Ochieng ensuring that his opponent did not go the full distance. Boxing is in the family of the Smith’s whose brothers Paul and Stephen are British super-middleweight and super featherweight champions. As expected, Ochieng used the ropes effectively to score some heavy blows to the body and head of Smith who was however resilient and effective with the jab as he weaved around the ring. It was Ochieng who dictated the pace in the opening rounds landing good shots to the body and head. 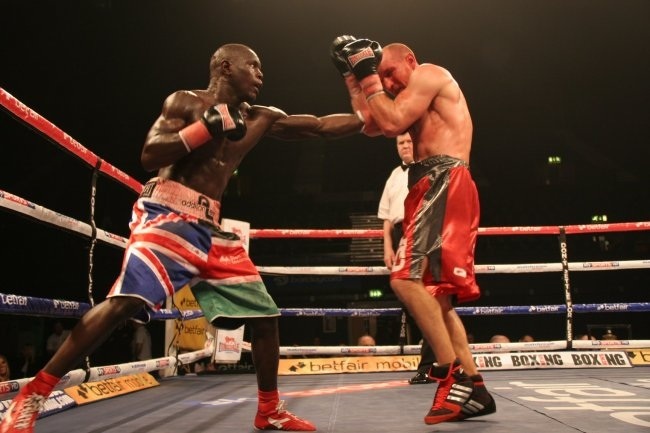 Smith took control of the fight although Ochieng came back strongly to win the seventh round. While Ochieng was keen to land heavier punches, Smith consistently scored with his right hand. In the ninth round, Smith caught Ochieng with a wicked right hook and followed it up with a straight jab. Two left hand jabs with 44 seconds left had Ochieng in trouble. Twenty two seconds before the end of this round, Smith landed good combinations. In the tenth round, Smith took control pinning Ochieng to the ropes in the second minute. Ochieng came off the ropes and caught Smith with three successive jabs but failed to land the effective uppercuts which were his trademark in the opening rounds. The 11th round saw Smith pin Ochieng in his corner and Ochieng worked his way from the ropes but failed to trouble the new champion. With one minute left, Ochieng again backed on the ropes and landed telling blows which did not trouble the new champion who regained his composure. With 30 seconds left, the boxers traded heavy blows and Smith was in control with Ochieng looking wobbly in Smith’s corner. The last round saw Smith pin Ochieng in Smith’s corner but knowing that he had done enough let Ochieng chase him around the ring. Ochieng was gunning to be the first Kenyan-born Briton to win the title.